Among his later books were some on serious topics. In "The Butter Battle Book" (1984), he introduced young readers to the dangers of the nuclear arms race. 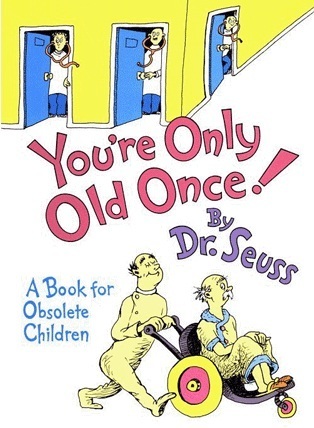 In 1986, in "You're Only Old Once!," he addressed the problems of old age in a book for grown-ups. Edward Sorel, writing in The New York Times Book Review, said the book was illustrated with Mr. Geisel's "characteristic verve and imagination." But, he added, "there's something amiss in the blithe assumption that the sort of rhymes which delight a 4-year-old (or an adult reading to a 4-year-old) will still entertain when read alone through bifocals."